Give your belly button piercing a comfortable new feel with our range of BioFlex belly button rings. Unlike traditional metal jewellery, BioFlex navel rings are soft and flexible, so they are really comfortable to wear. BioFlex is similar to PTFE but comes in a range of colours and lots of cute designs like the one on the right. BioFlex is also very biocompatible and it can help with piercings that are easily irritated, sore or refuse to heal up. 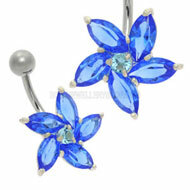 If your piercing is often red and angry, I recommend switching to a BioFlex belly button bar straight away. BioFlex is also non-stick, so they are easy to keep clean and help your piercing to breathe. This entry was posted in BioFlex Body Jewellery, Navel Bananabells and tagged Belly Button Navel Ring, Belly Button Navel Rings, Belly Button Ring, Belly Button Rings, BioFlex Body Jewellery, BioFlex Piercing Jewellery, Bioplast Body Jewellery, Bioplast Piercing Jewellery, Navel and Belly Button Jewellery on April 8, 2011 by Piercing Guru. 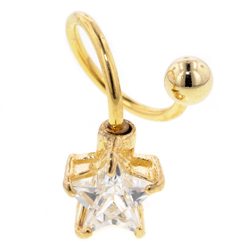 Show off your belly button piercing with one of our gorgeous sparkly belly button rings. Here at Body Jewellery Shop we have a huge range of belly button rings but the most popular ones are the sparkly styles! Everyone loves a bit of glamour and a sparkly belly button ring is the perfect way to show off your piercing. The best types of belly button rings are BCRs and circular barbells. The rings shown below are BCRs but we have plenty of circular barbells in the online store. It is very important to get the right diameter belly button ring or can get very sore. The best way to figure out your size is to measure a belly button bar that you already have. Measure straight across between the two balls – you need a belly button ring with the same diameter as this measurement. 10mm is the most common but please measure your jewellery before you buy. Sparkly enamel belly button rings are a new type of jewellery that combines the durability of surgical steel with cute colour. The belly button ring on the right also comes in white and it makes a fab alternative to the regular silver belly button rings. Enamel steel rings are comfortable to wear but we recommend that you wait until your piercing has completely healed up before wearing them. 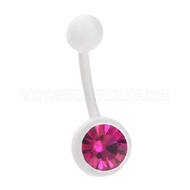 Once your piercing is healed you can switch to a cute enamel belly button ring like this one. This entry was posted in Ball Closure Rings, Belly (Navel) Piercings and tagged Belly Button Navel Ring, Belly Button Navel Rings, Belly Button Ring, Belly Button Rings on October 14, 2010 by Piercing Guru.